I moved into a new house with my boyfriend last month, and I am just now getting around to setting up my sewing room. Luckily it’s a rather large room, so I finally have plenty of space to have a separate table just for cutting, a huge ironing board and a large desk for my sewing machine…and yet ANOTHER table that I’m going to use for laying out my projects as I work on them, especially when piecing blocks. Now I wish I had taken a picture to upload. 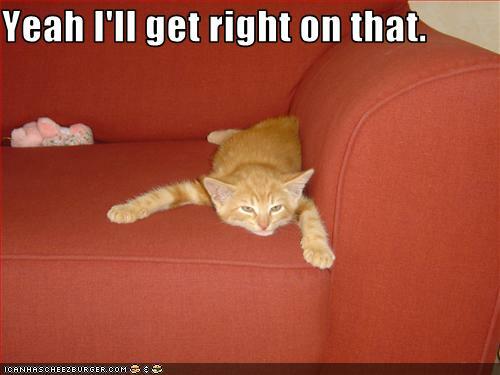 I’ll work on that! In December, Rosebud’s Cottage posted some inspiring photos of her workspace that I bookmarked and plan to use for ideas. Also, this week Mary Englebreit posted pictures of hers. 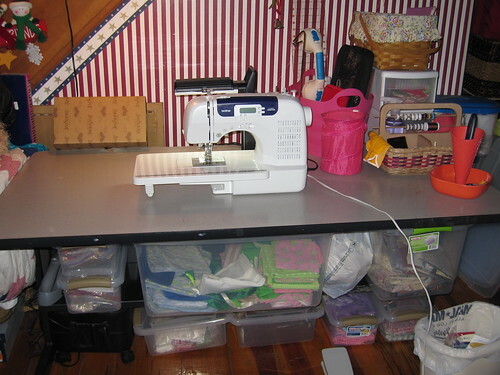 What ideas do you have for a sewing/craft room? Share pictures or a link of your own or maybe a picture that inspires you! I guess I’ve been pretty absent from this blog, but so have my projects. I started on a Dresden Plate table runner but only got one plate completed. It was going to be a Christmas gift, but that’s definitely not happening now. I did make a basket or two since, but I haven’t had a chance to blog about them yet. I still read some blogs of other quilters, and I was inspired this morning by Lazy Girl Designs with some small project ideas using just 3 Fat Quarters for 3 projects. While I’m probably not going to do much sewing between now and the first of the year, I’m hoping to tackle more projects after I move in January. I’m pretty excited about the move, as I am going from a one bedroom apartment by myself to a 5 bedroom house with my boyfriend. Since neither of us have kids (and don’t plan to have any), we’re going to have lots of extra space, including a room JUST FOR MY SEWING (and other crafts). Anyway, my point was to share this link with anyone out there who might still be reading this rarely active blog. Go check out what Joan Hawley at Lazy Girl Designs has to share! As the final project of my long weekend and something LONG overdue, I organized. 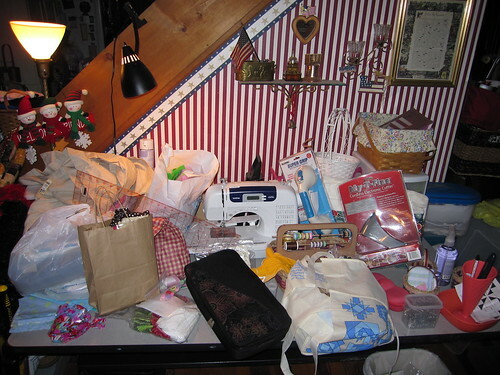 Most of my projects were semi-organized…in plastic grocery bags or various other bags that I picked up along the way. My system obviously wasn’t the most sophisticated, but at least I kept each project together with the other contents. The only problem was that I would have to look in each bag to find the project I was looking for. I kept all of the bags in this huge nylon car trunk organizer (not pictured) that I found last year at Wal Mart. It worked very well for keeping all of my projects together, but I purchased the organizer for my trunk and was unable to find another one to actually keep in my trunk. My mom talked about organizing her projects in plastics containers, and being a fan of plastic containers, I thought it was a good idea for myself, as well. It sure beat my current organization plan of bags in bags and sometimes in more bags. Besides, my desk was getting fairly cluttered, too. BEFORE - I don't normally have everything piled up like this, but I wanted to show everything that I was organizing and putting away for the After pictures. Most of the bulk is fabric for different projects. AFTER - Everything from the Before pictures is put away. Most of the bulk was fabric, which I organized by project in the plastic containers under the work table. It only took me an hour to organize everything, and I must say that I am quite proud of myself. I lean a bit toward the hoarding side in life, as I am seeing by watching Hoarders the past couple of months, though luckily not nearly as bad as most of the people on that show. However, one thing I have learned is that pretty much any hobby can make a normal person lean toward being a hoarder. Now I just need to organize everything else in my life like this! Lately it’s like this for me. As you can see, I am just starting this blog, so there’s not much here yet. My hopes are to blog about my experiences in learning to quilt by posting pictures of my works-in-progress, as well as my visits to quilt shops. I just started learning to quilt this year by starting a Block of the Month club with a local quilt shop. My interest grew as I got into it, and I am now working on a few projects at a time. The inspiration to start this blog came when I visited Las Vegas this pas week. I did a little Googling and found 5 quilt shops in the Las Vegas area that I decided to check out while I was in the area. I took pictures of the shops (which you’ll see in my Flickr, as well as posts that I will be making of each shop here soon), and got so many ideas for new projects. Then I remembered a blog that I had seen once where another person was blogging about her visits to quilt shops, and since I’ve been blogging for several years now, I figured I could post about my own adventures, too!